I am blessed/cursed (depending on what day you ask me) with arrow-straight, thick, slippery hair. Most of the time, it's great knowing that, no matter the weather, whether I blow-dry or use "product" or not, my hair is pretty much going to look exactly the same. For years, I paid insane amounts of money on haircuts (living in New York, you get convinced that that's normal), only to look back at photos and realize I couldn't see a difference in any of them (the one exception being a weather-girl bob I sported my senior year of college, which wasn't a good kind of different). The real downside to my particular hair-type is that it takes nothing short of a miracle to style it. If I want to do anything fancier than a ponytail (and, even then, only certain rubber bands will grip my hair enough to stay put), I have to seriously call in the big guns. So, a couple of years ago, when I discovered a big gun hairspray that actually holds a curl in my hair, it was as if a ray of light shined down from on high and a chorus of angels sang out. 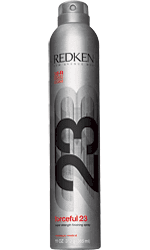 Hallelujah, Redken Forceful 23 Super Finishing Spray , $12.25 from Amazon.com. Somehow, this stuff holds my hair like super-glue without making it seem helmet-y or stiff. Now, curls stay in my hair longer than it takes to actually curl my hair. Whether you suffer from my particular hair affliction, or another (everybody's got something), the whole line of products is dynamite. When I have to travel (usually to a wedding) and I can't pack my Redken (my husband doesn't accept "But I need my hairspray!" as a good-enough reason to check a bag), I bring along Tresemmé Super Hold Hair Spray , about $1, which is available at pretty much any drugstore. I like that it's non-aerosol (the pressurized aerosol cans always leak all over my bag on a plane), I have to layer it on like I'm trying out as an extra on "Dynasty", but it actually works pretty darn well. My curls might not make it all the way through the last dance, but they're usually still going strong for the "I dos". Tip: if your hairspray nozzle sprayer thing gets clogged (mine always does), just run it under warm water for a few moments. Works every time. FYI - If you store your hairspray bottle upside down, your hairspray nozzle sprayer thing won't clog. I can't take credit for this idea as I read it somewhere.